HOW quickly things can change from one month to another. My January post had me back at my old job for the start of the new year, and this post has me starting a new job. I'm not kidding you that when I leaped, I really leaped. I was making plans to leave my former job. I commuted four hours daily and my directors were aware I was looking to leave the early starts, long days and inflexible hours behind in 2016 - at least for a little while. Rather, one phone call was all it took to set me on the path of an opportunity close to home, working with a grassroots community organisation moving from organic growth to strategic growth. I'll be setting down a communications strategy and implementing processes and ways of working that the small, already busy team and their customers can work with. I can't wait to dive in. The contract's for six months and I've got my eye firmly on what needs to be done while preparing for what comes next. This is going to be one busy and, hopefully, fulfilling year. I'm ready for it. THINGS TO MAKE AND DO: Maybe if I start on these this month I should be able to wear then when the weather turns cool. I am a fan of the leg warmer. 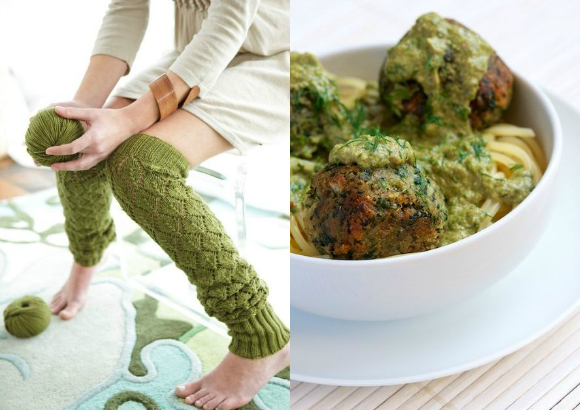 THINGS TO COOK AND EAT: Spinach balls with pesto sauce. I'd make enough to ensure there was something to pack for a work lunch. I'm going to have get better at preparing my lunches the night before. I was spoiled in the city for lunch choices but it wasn't great on the waistline and cost a fortune. I'm going to be a lot more controlled, on both fronts. 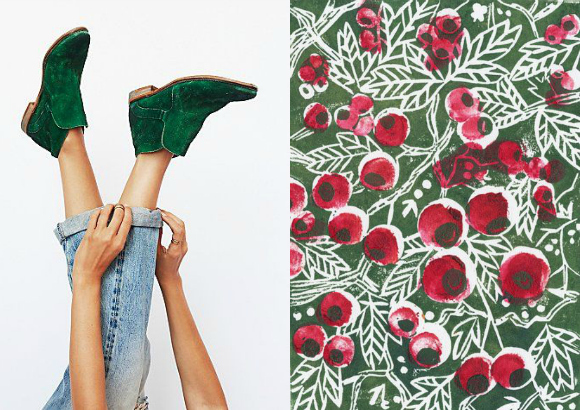 THINGS TO DROP DOUGH ON: Green boots. Need I say more? I don't really need new work attire, but if these boots were to come into my life, I wouldn't be complaining. THINGS TO HANG ON THE WALL: I actually think this would make a stunning, if not over the top wallpaper of furnishings fabric. My partner and I bought a delightful mid-century single rocker for $50 at the op shop last week. The fabric on it is great but needs a clean up. We're also thinking about reupholstering and something like this would be on my short-list. #flashback: I was trying to keep the summer holiday glow alive, without success. Hello you. Thanks for stopping by, it’s made my day. No, really, it has. Anyone who loves op shopping, pottering in the garden, baking from vintage recipe books and having a good old nana natter is my kinda human being. Please stop by again soon. I LOVE those leg warmers. I have one single (very plain) one that it took me all of last winter to knit. Fingers crossed this winter will see the other one finished and then NEXT year I can wear them. Rachel, it may well be much the same here. I have grand ambitions of getting those warmers on the sticks, but I already have a summer top only a quarter of the way done. Story of my creative life. A four hour commute !! !...I can't believe that. I work from home and feel incredibly lucky. ....working closer to home sounds like a wonderful opportunity for you ...best wishes all goes well. Two hours each way. Ya better believe it. I'm not the only one, there's 30,000 of us from the Central Coast alone, and a lot more starting to commute from Wollongong way. The cost of living in Sydney's just too great. Thanks for the well wishes. Day one and I feel a different person. Jen, you do find ways to make the commute work. I read an enormous amount, knitted, wrote a great deal - both for myself and paid work as well. I corresponded with friends, listened to audio books. You name it, I found ways to do it. What I lost out on was personal health, social interaction with family and friends and taking on projects that I could invest time and energy into. The routine of commuting is finite. Anything upsets it and your day, or even your week, can be thrown right out. You need to be at once, both extraordinarily rigid and extremely flexible. You'll be fine and that space away from your work will be worth it. I never regretted where we'd chosen to live. It's been perfect for this phase of our lives. Thanks for the solace and tips. I am already finding that if I'm well rested the commute is quite enjoyable time to spend working or reading, or just mulling over things, whereas if I'm exhausted it drains me further. And as you say, the trade-off of living somewhere that I'm finding so relaxing and where it's so much easier to be outdoors does make the choice something I don't regret. Thanks for that. I can't wait to get it cleaned up and in the house. With my stepdaughter living with us - and her bub - it's a bit of a squeeze at the moment so it's in the shed and under a sheet. We bought it for $50 when we knew we were too busy and stressed to do much more, but it was too good to pass up at the price. We've parked it until we have the headspace to come back to it but Julie Paterson, of ClothFabric, opened an exhibition in our local regional gallery last week and we're already swooning over the options.